The picture shows the shape of the moon as it is invisibly projected on the earth’s surface during an occultation of a star. The lunar terrain features are considerably increased in scale. The shadow can move over the earth in different angles but always from west to east according to the motion of the moon. 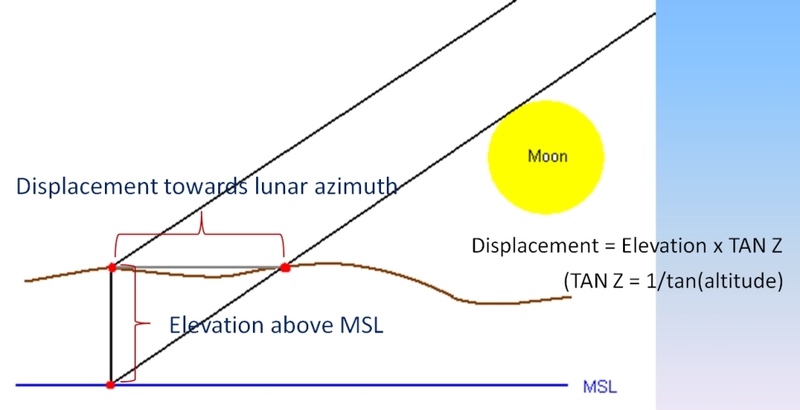 The path of the mean lunar limb on mean sea level (MSL) is the one that is always calculated and shown in the predictions. 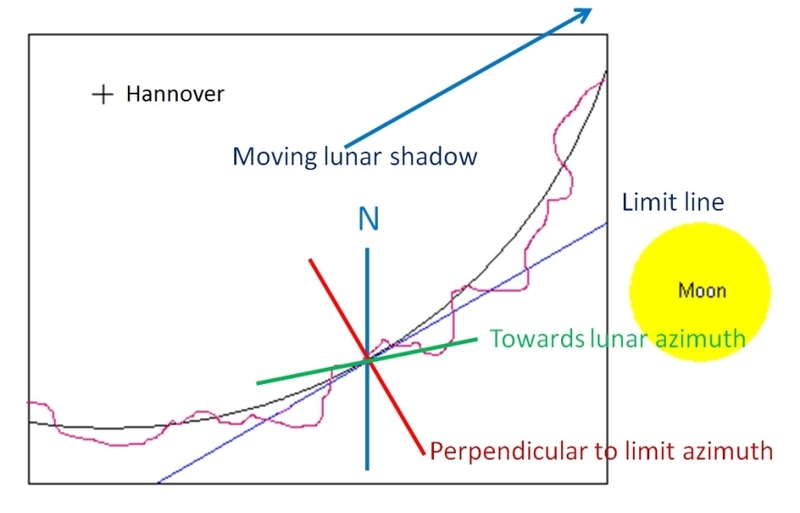 The planning of the location of observing stations needs to take into account the positive and negative extent of the projected lunar limb structures over the mean limb as well as the altitude on Earth. Due to the lunar parallax the line of view to the moon and thus the distance of the lunar surface to the star to be occulted changes with the altitude of the observer. Therefore the observing position must be adjusted accordingly by a displacement in the direction of the lunar azimuth (see picture below). The picture below shows a part of the southern sunlit lunar limb in true scale covering about 1 degree of position angle. The dotted line marks the mean lunar limb which is overtopped by the true lunar terrain in this area. The right curly bracket includes an angle of 1 second of arc which equals 1.9 km on the moon at mean lunar distance from earth. The line dashed blue and white is the apparent stellar path, where each equally colored leg shows the lunar motion within 10 seconds of time (see bracket below). At mean lunar distance in 10 seconds about 10.3 km of lunar terrain move alongside the star. Since the moon moves approximately 1 km in one second a timing precision of 0.1 seconds results in a horizontal terrain resolution of 100 meters. Since most visual timings do exceed the precision of 0.3 seconds the resolution of approximately 300 meters is not competitive to the least quality measurements of the Kaguya and the LRO spacecrafts. Timings by video means show a better time resolution usually referred to 0.03 seconds yielding a very competitive 30 m of horizontal resolution. To achieve measurements that allow reduction to this precision also the coordinates and the altitude of the observing site must be precise. Only an offset of some 15 meters is allowed, which can be easily be reached with any GPS device or by using Google Earth. But also visual observations have still their value! Especially at the edges of a grazing occultation event (in the highest or deepest lunar terrain structures) it is always good to add visual timings or even missed reports to the video data. If there is a dis- and reappearance at one location and none could be seen visually at station at just a little distance to the video station then even the visual observation contributes to a high precision.